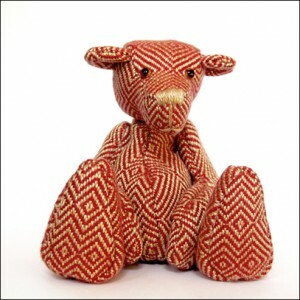 As a winner of BBC 2’s Paul Martin’s Handmade Revolution Cedric is a very special bear. He was also displayed at the Victoria and Albert Museum where he was adopted. Cedric is a thoughtful 4″ sitting teddy bear handmade using specially selected Tencel yarn. His fabric has been handwoven using twill based structures. The traditional techniques used to make him were all done by hand, including the sewing, cotter pin joints, glass eyes and stitched nose. The glass bead filling gives him a sturdy weight.